Last year I took head massage sessions at a parlor and those were like nightmares for me. I don’t like massaging at all and I literally asked the helper to stop massaging. The parlor aunty was really surprised and told me girls liked massaging so much that they ask for more. Anyways instead of running for parlors I searched online for a good head massager and saw this cute massager from Bokoma. 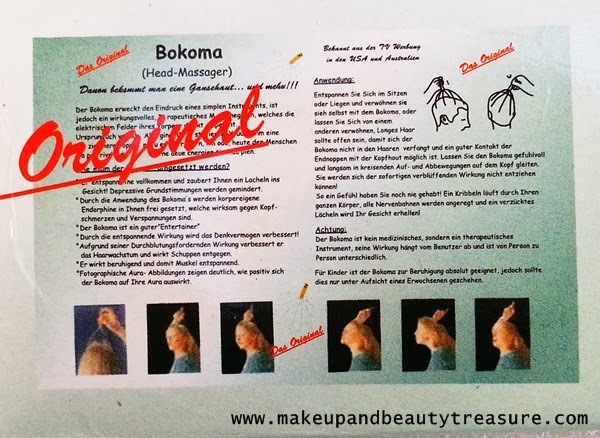 Today I am going to discuss my experience with Bokoma Head Massager. The BOKOMA head-massager combines the millennium old tradition of the Aborigines with modern materials. The BOKOMA is placed gently on the head and you begin with a massage of the entire scalp. The first contact will send a comforting shiver over your back. During the massage the BOKOMA will gradually unfold its relaxing effect throughout the entire organism. Bokoma Head Massager comes housed in a green cardboard box packaging. It is made of a wooden handle with metal prongs. The prongs are of two lengths, one slightly longer than the other. They are securely fitted in the handle alternatively. They have smooth black plastic caps at the ends that avoid your head being scratched. The head massager is really easy to use. You just need to move it up and down on the top of your head. 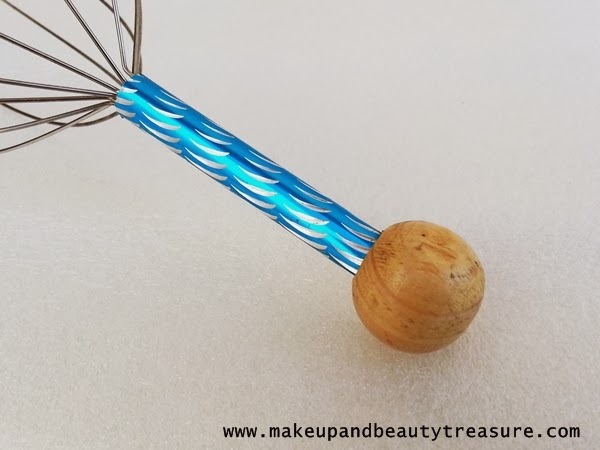 The metal prongs are bendable and they adjust or reposition themselves as you move the massager up and down. The plastic caps are really smooth and stimulate different nerve endings giving you nice and relaxing sensations. It can be used on your own or you can always disturb your mom for doing it for you (Puppy face always works!). I usually massage it for 3-4 minutes when I feel bored or when my head needs to be scratched due to dry and itchy scalp. 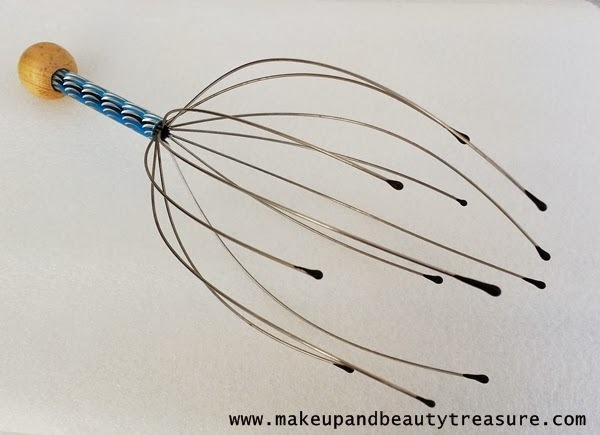 The head massager really calms and gives soothing sensation. I use it slowly for a soothing massage but you can always use it quickly when in hurry. Either way it won’t hurt your head! I massage my head for only few minutes as my hands starts paining. 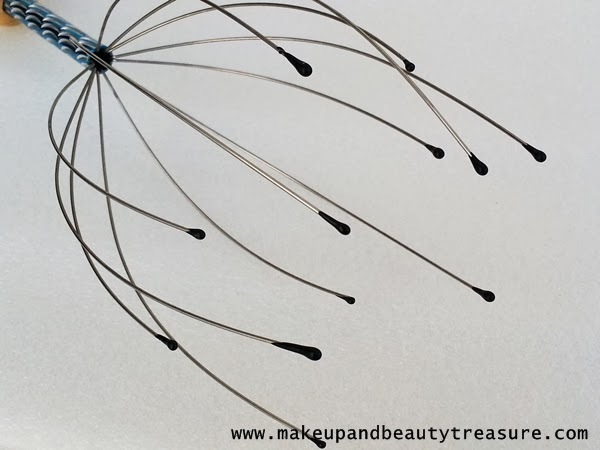 Before using the head massager, I make sure to comb my hair well to avoid tangling my hair. Bokoma Head Massager is quite sturdy and would last me long. It’s been 1.5 years since I have been using it. It is still in great condition. The metal prongs are securely fitted in the handle and the caps have not been worn off yet. • Gives relaxing and soothing sensations. Bokoma Head Massager is an effective massaging tool at such a great price. It relaxes the nerves and gives soothing sensation. I am absolutely in love with this tool and would happily recommend it to everyone! 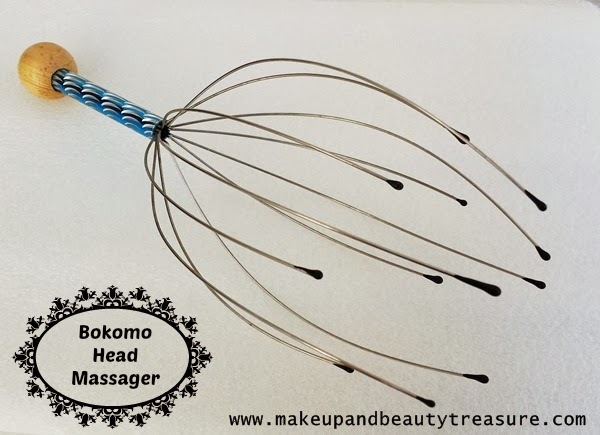 Have you tried Bokoma Head Massager? How was your experience? Share in the comments section below! I have this and I love it!! My bro bought this for me a year back! Its really a great product Gowthami! Looks a great product. ..cute bhi bhut hai..
Thanx di :*. Aap konsa massager use karte ho? good it worked for u dear.. nice review! Even I use it. It is really effective and addictive. My guy loves this to core. Whenever I massage my scalp with this I feel my hair become more voluminous as it lifts the roots. I get mine from 99stores and it costs 30-40 bucks I guess. I like the idea of it and it looks very good and low maintenance :) Will definitely try this! never seen such a product....sounds great! definitely wants to try in future!